fixBuffalo readers will remember MJ's amazing aerial photographs of Buffalo, NY that I've posted as Air Buffalo and Air Buffalo Part II. Just found this one...two very different sides of Main Street. In the foreground is the City's near east side. That's Artspace off to the left and St. Vincent's orphan home, in the center. 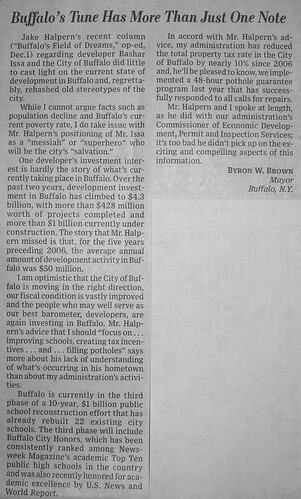 Finally got my hands on Byron Brown's response to Jake Halpern's recent Wall Street Journal article about development and economic issues here in Buffalo, NY. The following letter appeared in the Decemeber 11th issue of the Wall Street Journal. The full text of Jake's December 1st article is available here - Delivering Redemption. Drove by Bethel Headstart's new building at the corner of Woodlawn and Jefferson yesterday morning and noticed the Savarino sign hanging on the fence. Clicking into this Savarino link, noticed that Foit-Albert Associates are the architects, too. No renderings on either site. A few fixBuffalo readers passed along Jake Halpern's recent Wall Street Journal article about Byron and Buffalo, NY. If you haven't read Jake's take on Buffalo, you should. I grew up in Buffalo, New York, which may best be known as a place that people like to leave. Indeed, since 1970, the city has lost almost forty percent of its population. In some parts of Buffalo, this never-ending exodus has created a landscape worthy of the great post-apocalyptic thrillers of our times – films like Escape from New York or 28 Days Later. As kids, my brother and I would explore these modern-day ruins, venturing into crumbling train terminals and abandoned factories where moss carpeted floors, rainwater gushed down empty hallways, and peeling wallpaper rustled in the wind like the frayed bark of birch trees. 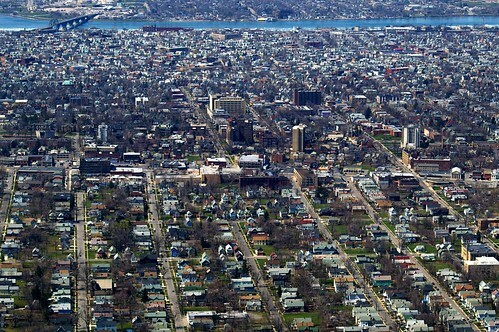 Of course, Buffalo has plenty of inhabited and very well-maintained neighborhoods. I have lived in a number of cities around the world and I’ve never seen a street more lovely than Delaware Avenue, in Buffalo, with its grand old mansions, stately carriage houses, and immaculate gardens. No matter how one spins it, however, the fact remains that Buffalo is in trouble. Abandoned houses are such a problem...read the rest. Very cool comment stream about Jake's article about Buffalo in a recent BuffaloRising post and don't forget to check out his take on various contemporary cultural issues from his site, Jake Halpern. I noticed that our Mayor responded with a letter to the editor, last week. As soon as I can locate it on-line will make it available. Checked out progress at Bethel's new building here at the corner of Jefferson and Woodlawn. Place looked like this just a few weeks ago. Rev. Stenhouse is doing this project. Will continue to watch what's happening here. A few more 'vinyl victorian' foreclousures crossed my desk this week. Went and took a look at two of them on Saturday afternoon. The first one here at 404 Madison is just a block away from the new suburban dreamscape at Sycamore Village. Originally sold in 1994 for $86000. 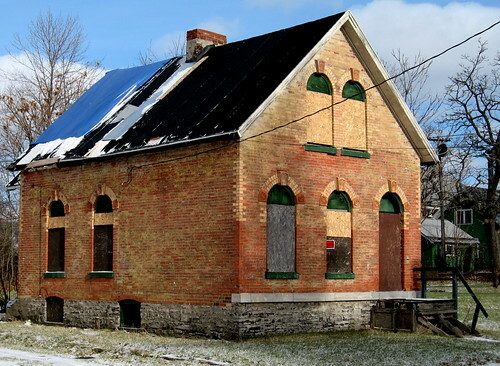 It's currently assesed by the City for 65K and today the asking price is $27,000. Expect it to finally sell in the mid to high teens. This 'vinyl victorian' foreclosure is located at 757 Woodlawn Avenue. Place originally sold for $84,500 in 1998 and is currently assesed by the City for 54K and the asking price today is $45,000. 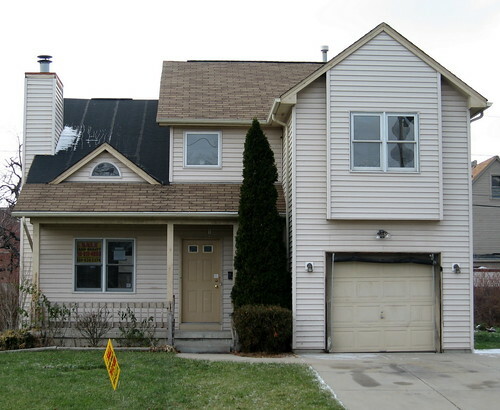 Similar homes in this part of Buffalo have been re-selling in the low to mid-thirtes. If you haven't visited Sycamore Village yet, here's the archive. I've been keeping track of a number of additional 'vinyl victorian' foreclosures in the same area - here and here. I mean why buy a brand new 'vinyl victorian' in Sycamore Village, when you can buy one for about 10% a block or two away? Anyone see a pattern developing? I checked on the Lyth Cottage over on Harwood Place yesterday afternoon. 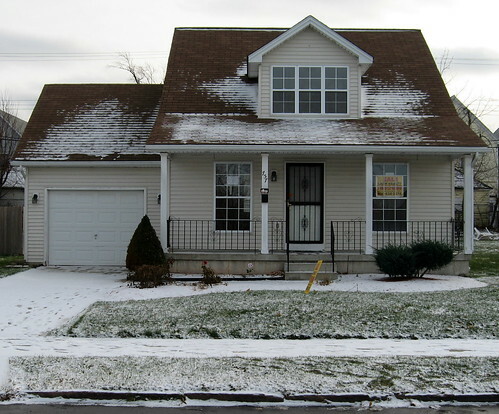 16 Harwood Place was recently sold to a local guy during the City's special September 22 auction. The sale price, $3800 - yes, thirtyeight hundred! Fortunately he's already taken some steps to seal the place for the winter. The City previously owned it for the past 10 years. Here's some of the fascinating historical details and story of - 16 Harwood Place.